Q: Are you taking the piss? A: No. The public toilet (alongside the recreation reserve and the public hall) is one of the pillars of any self-respecting Victorian community. 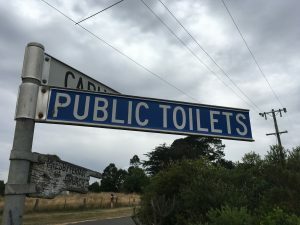 Wherever you might travel throughout this great state, you’ll find a welcoming blue sign proudly pointing the way to a free public shitter. That’s cause for great celebration—and a dedicated website. 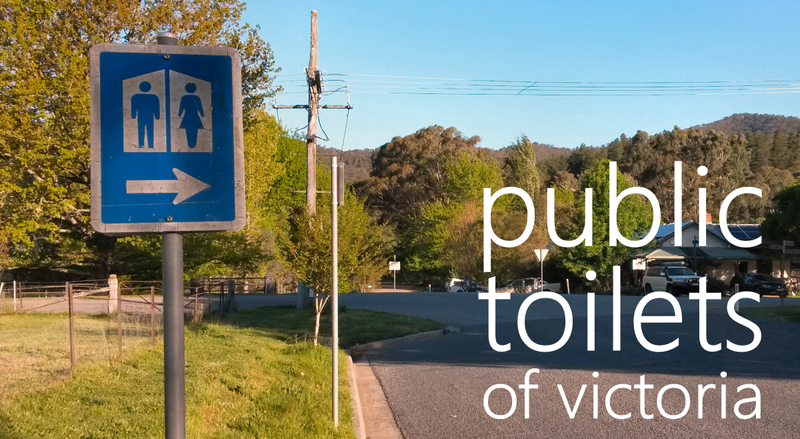 Q: How do you choose which public toilets to include on Public Toilets of Victoria? A: How does the Whale know when to migrate? How does the Magpie choose who to swoop? We are drawn to certain dunnies by a mysterious yet unwavering vibe. We can’t put this vibe completely into words—we can only try to scratch its surface. Is the dunny of a stout construction? Is there a gum tree visible from the entrance? Is it proudly placed in a prominent location, rather than hidden away? Is the loo roll of the smeary wax-paper variety? Were you sent there by the local bakery, who will not let you use their toilet even if you buy a king sized sausage roll? Q: Do you actually recommend using the public toilets that you feature on this site? A: We make no promises about the quality of the facilities featured here. At any or all of these locations it is possible you will be chased out of the cubicle by dunny budgies, or have a spider attempt to leap up your bum. It is one of the great national ironies that the only thing more Australian than a no-nonsense public toilet is the desire to avoid actually using said toilet for anything more than an upright wee unless absolutely necessary. That’s why Public Toilets of Victoria is not in the filthy business of reviewing public toilets. You’ll find no rankings or scores here. Instead, we’re full-on committed to the honest task of celebrating public toilets, and the glorious vibe they emit (among other emissions). Q: Is it un-Australian to pay for a poo? A: Yes it is. Make no mistake—in public toilet terms, Australia is a socialist paradise, founded on the earnest belief that every person in this great Commonwealth should be able to relieve themselves, for free, in a publicly owned dunny. It is enough to make one’s breast (and bladder) swell with pride. Compare this to vast reaches of the globe, where it is possible to travel for weeks without finding a single free public toilet. At best, you rely on the charity of store and restaurant owners. At worst, you have to fork out your hard-earned to an attendant or automated barrier for the very privilege of going to the toot. It is our combined civic duty to make sure this rank practice never takes hold here. To assist, we have ranked the options you should exhaust before you even contemplate paying to enter a toilet block on Australian soil: (1) Public toilet. (2) Side of road. (3) Pub. (4) Fast food restaurant** or petrol station. (5) Bakery, cafe, or general store (incidental purchase required). (6) Break into private property. (7) Admission to hospital. (8) Pay for poo. ** This can be ranked higher if it is the McDonalds on the Hume Highway out near Glenrowan, but only if you are in a hurry and have already seen the giant Ned Kelly statue in town. Q: What do you think of those fancy, stainless-steel, automatic, self-cleaning public toilets? A: Bloody awful. A third of the population refuses to use them out of fear of being trapped in there and squirted by the cleaning robot. Another third refuses to use them after the electronic “lock” button malfunctioned on them once, leading to some unwanted visits from members of the public. The final third (of which Public Toilets of Victoria is a member) recognises that they are soulless wastes of money with no contribution to the National Character whatsoever. This one alone cost $453,400! Better instead to build a simple brick shithouse with no roof and employ someone to hose it down every Sunday. Jobs! Q: What are the greatest two uses of taxpayer dollars in Australian history? A: Excellent question. 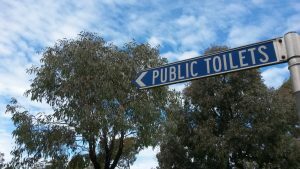 The second greatest use of taxpayer dollars in Australian history is the National Public Toilet Map, a searchable Australian Government database of over 16,000 public toilets through the nation. The greatest use of taxpayer dollars in Australian history is the construction and maintenance of the public toilets that populate said map.